Uniquely designed wall art illustration of Ruth, from the Old Testament, an antique Bible page replica with Scripture quote in artisan font to match. The simple frame reflects the style of a bygone era, yet is a perfect complement to the home decor of today. 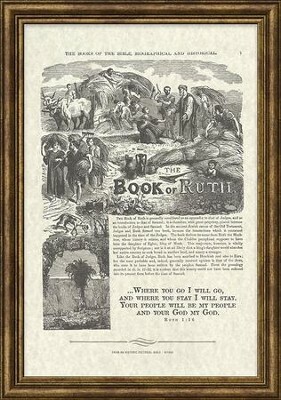 I'm the author/artist and I want to review Book of Ruth Antique Bible Page, Ruth 1:16, Framed Art.